It took until the second night in the NCAA tournament’s second weekend, but a No. 1 seed has been slayed. North Carolina's hopes of capturing a seventh national championship have ended. In a fast-paced Sweet 16 battle of the Auburn Tigers and the North Carolina Tar Heels, it was the SEC tournament champs coming out on top, 97-80 on Friday night in Kansas City, Missouri. The Midwest Region is the first of the 2019 men’s NCAA tournament to lose a No. 1 seed. In a tournament that had been mostly chalky, this result — a No. 5 seed beating a No. 1 handily — is the surprise so far of the second weekend. The Tigers are now the lowest remaining seed in the tournament. Carolina's season is over and no I'm not ready for that to be true. Auburn topping North Carolina marks the first time a No. 5 seed has beaten a No. 1 seed since 2011, when Arizona bested Duke in the 2011 Sweet 16 in the West Region. For Bruce Pearl’s squad, it marks just the second time ever that Auburn has advanced to an Elite Eight. The first — and previously only — appearance for the Tigers in that stage of the Big Dance was in 1986. The Tigers have never appeared in a Final Four. Auburn paved its way to the Elite Eight with precise shooting and stellar performances from key players. As a team, the Tigers shot 54.5 percent from the floor and 45.9 percent from behind the arc. They struggled at the free throw line, making just 8-of-17 attempts, but it didn’t matter. Auburn has hit 107 3-pointers in its last eight games. 13.4 a game. That’s outlandish. Chuma Okeke led the way for Auburn with 20 points, 11 rebounds, two assists, two steals and a block. However, he did exit the game early with an apparent injury. In an off-the-bench effort, Danjel Purifoy chipped in 14 points for Auburn. Three other Tigers also scored in double digits. The Tar Heels had a five-point lead with about three minutes to play in the first half, but Auburn cruised into halftime on a 6-0 run. From there, the Tigers dominated the second half, taking a 19-point lead at one time. North Carolina struggled to make shots. 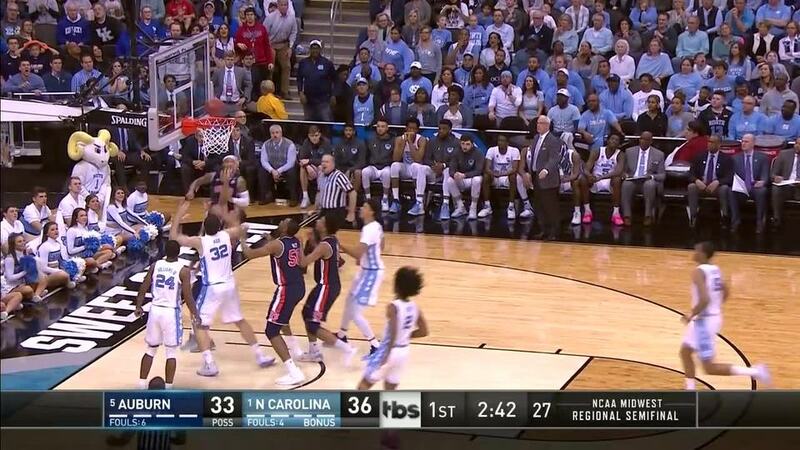 At times they were frustrated by Auburn’s defense, and in other moments, the Tar Heels simply missed. Roy Williams’ side shot 43.1 percent from the floor, 25 percent from three-point range and coughed up 14 turnovers. This was just the second time that North Carolina had lost a Sweet 16 game with Williams at the helm. In their final collegiate games, Luke Maye and Cam Johnson did all they could. On 14 shots, Maye had 13 points to go with seven rebounds, three assists and a steal. Johnson, attempting 11 shots, scored 15 points and collected five rebounds and three steals. Seeing sad Cam Johnson makes me sad. Duke fans inside Capital One Arena are pleased with the Auburn-UNC score. The Tigers haven’t lost since Feb. 23. That day, they fell in a regular season contest to the Kentucky Wildcats, who are seeded second in the Midwest Region. Since then, the Tigers have racked up 11 straight wins. Auburn could face Kentucky again in the Elite Eight. The Wildcats face third-seed Houston at 10:06 p.m.